Auschwitz: where is the root of Polish guilt? The statement by Polish Foreign Minister Grzegorz Schetyna, claiming that it was Ukrainians alone who allegedly liberated the prisoners from Auschwitz, needs no further comment. We’ll let that remark lie on its author’s conscience, as he seems to have “forgotten” about the thousands of his own countrymen who fought heroically against fascism as part of the Armia Ludowa. In the end, Schetyna’s revisionism merely echoes the long-established opinions of some nationalist Polish historians. For example, back in 2005 the late Pawel Wieczorkiewicz, a former professor at the History Institute of Warsaw University, was quoted in the newspaper Rzeczpospolita as saying that he felt it would have been helpful to have had an alliance between Nazi Germany and Poland. That’s nothing new, there’s plenty of photographic evidence of the friendship between Polish nationalists and Nazis. Government officials simply agreed with the scholar’s conclusions. 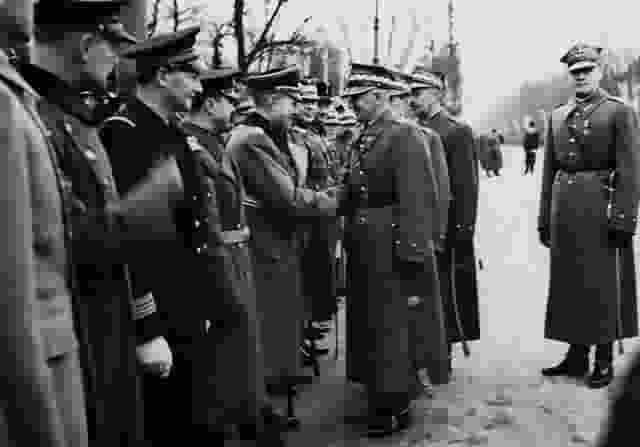 A handshake between Polish Marshal Edward Rydz-Śmigły and the German attache, Major General Bogislav von Studnitz, at the “Independence Day” parade in Warsaw, November 11, 1938. Nevertheless, Schetyna’s statement gives us a good reason to take a closer look at the data in the archives. Who did the Red Army, which included people of every nationality living in the Soviet Union (including Poles), expel from liberated concentration camp? Let us peer through Mr. Schetyna’s nationalist “glasses” and take a look at the ethnic composition of the collaborators who were guarding Auschwitz. Immediately we see that there is a great deal of evidence that ethnic Poles and Ukrainians (known as “Trawniki men”) volunteered for duty in the execution brigades and as camp guards. Ethnic Germans, even those “devoted” to the SS, viewed such “work” with contempt. 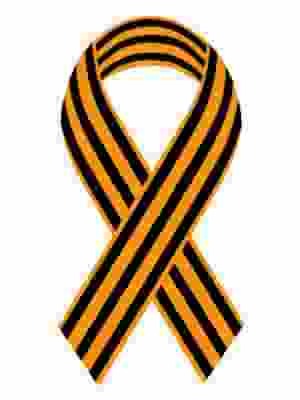 Many of the Polish-Ukrainian collaborators fled to Canada after the war. There they have been living out their lives in peace, and are now watching, no doubt awash in happy nostalgia, as their disciples, bearing torches, march triumphantly under the Wolfsangel rune in Kiev. Apparently this skeleton in the closet so haunted the professor and diplomat that the Polish Foreign Ministry grasped onto an alternative history. “They prefer to call themselves ‘victims’ and emphasize their own suffering under Soviet rule, ignoring the fact that they themselves exterminated Jews on a massive scale,” notes Dr. Efraim Zuroff, a respected historian and the director of the Simon Wiesenthal Center office in Israel. Here is just a sampling of facts about precisely from whom the Red Army rescued the prisoners at Auschwitz. Information from the official archives of the Auschwitz-Birkenau State Museum proves that at various times the Blue Police (“Granatowa Policja”) were made up of Polish collaborators who helped send people directly from train stations to Auschwitz. 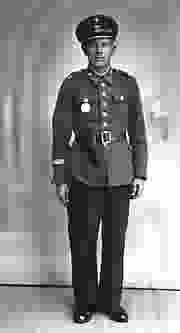 Pictured is a Polish police officer in the Governorate General, German – “Polnische Polizei im Generalgouvernement,” Polish – “Policja Polska Generalnego Gubernatorstwa”). These sturdy Polish fellows in blue uniforms helped the Nazis at train stations and borders. The 1946 book, The Death Factory (“Továrna na smrt“, Czech language), written by Auschwitz prisoners from Czechoslovakia (cited according to the Russian edition, State Publishing House for Political Literature, 1960, Moscow), tells about the “Polish prisoner doctor, Vladislav Doering” (pg. 112), who took part in the inhuman experiments conducted on prisoners, and about the barracks leader Stefan Wierzbic from Upper Silesia, who preferred to kill prisoners with “three blows of club” (pg. 53), and also describes the unique method of curing the ill with beatings “from the Polish prisoner doctor Zenkteller” (pg. 82). The authors of this book identify as Polish fascists: the barracks leader Bruno Bronevich; Raportschreiber Kazimierz Gosk from Warsaw; Julius Miklus; and others (pg. 252—253). Many Polish names can be found in the list of the SS members who were guilty of particular brutality towards prisoners at Auschwitz (pg. 231). Tadeusz Piotrowski, a well-known American professor of Polish origin, provides a good selection of sources on the subject of Polish collaboration at Auschwitz in his book, Poland’s Holocaust: Ethnic Strife, Collaboration with Occupying Forces and Genocide in the Second Republic, (1918-1947). Among other matters, he relates about Polish blackmailers (“szmalcowniki”), who demanded money from Gypsies, Jews, and Communists, threatening that these “enemies of the Reich” would be otherwise shipped to Auschwitz. So, while the Red Army and the Armia Ludowa partisans (which included ethnic Poles who were fighting the fascists) were liberating the country, what did those Polish collaborators, whose interests the Foreign Ministry in Warsaw has been so zealously defending, do? Why Mr. Schetyna is so committed to such defense? Isn’t it because his own relatives were collaborating with Nazi occupants back then as the officers of Granatowa Policja? 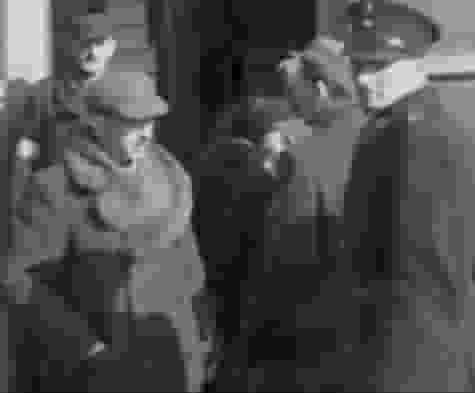 At least the following archive photo below taken in March 1943 at the railway station of Sobibór extermination camp shows a Polish officer of Granatowa Policja named Kazimierz Schetyna (on the right). Source: State archive of the Brest district, Belarus. The Sobibór camp was situated near the town of Włodawa (Lublin district of occupied Poland) and was operated since May 1942 until the only successful uprising in the history of Nazi concentration camps, led by the Soviet POW Alexander Pechersky, took place in October 1943. According to official estimations, around 200 thousand prisoners (mostly Polish Jews and Soviet POWs) were murdered in gas chambers there.